A recent study presented at the 2016 meeting of the American Association for the Advancement of Science (AAAS), has found that as many as 5.5 million people die every year as a result of outdoor air pollution, highlighting the urgent need for industrial air filtration to clean indoor air. What’s even more troubling is that more than half of those who die each year from outdoor air pollution live in China and India, which not coincidentally, happen to be the two fastest growing economies in the world. And as giant industrialized countries such as China and India begin to grapple with the issue of poor air quality, researchers at the AAAS meeting said that even with an effort to reduce emissions, the death toll from outdoor pollution will rise in the next 20 years. Outdoor air pollution is an intractable healthcare problem that resists easy solutions. As large countries such as China and India continue to accelerate their industrial development, they also increase the sources of air pollution that are creating a haze of smog over their largest cities. Researchers have pointed to industrial manufacturing, power plants, and coal-burning factories as the most common source of air pollution in urban areas. These processes release particles into the air that are inhalable, and that can cause a number of breathing problems, including asthma. Not surprisingly, particulate matter – also known as PM – is the most prevalent contaminant in most cities that are plagued with bad air pollution. PM is a mix of solids and liquid drops, and includes particles such as dirt, soot, dust and smoke that can be seen with the naked eye, and other particles that are so small only a microscope can detect their presence. PM typically forms in the upper atmosphere, and occurs from a reaction between chemicals that include sulfur dioxide and nitrogen oxides. In the U.S., the Environmental Protection Agency (EPA) has created a website known as “AirNow,” which lets citizens check the Air Quality Index (AQI) every day. The AQI is a measure of the cleanliness level of outdoor air, and also includes information about possible health effects based on the AQI level recorded that day. In addition, the EPA has initiated a flagship Air Quality Flag Program to help schools, community organizations and air quality agencies understand how to know when outdoor air is too polluted for recreational activity. And as part of its effort to lower air pollution, the EPA requires industrial companies to adhere to the tenets of The Clean Air Act, which sets standards for the amount of pollution that a facility can generate. There are six common contaminants named in The Clean Air Act, including particulate matter, lead, nitrogen dioxide, ground-level ozone, carbon monoxide and sulfur dioxide. Outdoor air pollution has a detrimental effect on indoor air quality, which poses just as many health risks. But unlike outdoor air pollution, which is not subject to filtration devices, indoor air quality can be improved through the use of industrial air filtration systems. Industrial air filtration is applicable to labs, data centers, hospitals, power plants, factories and other sites where outdoor pollution creates poor indoor air. Industrial air filtration systems can be added to ductwork that is already installed at a facility, but are also available in mobile units that can be placed in a variety of locations for optimal air cleansing. For more than 50 years, Camfil has been providing the most technologically advanced industrial air filtration systems. Camfil offers the most efficient industrial filtration systems to clients throughout the world, and has built its reputation on providing quality on a budget. Camfil operates under the guiding principle that clean air is the right of all humans no matter where they live. The company is well equipped to offer clean-air solutions to any facility that seeks to improve its indoor air quality, and the overall health of its employees. 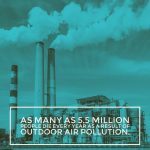 The post Study Finds Outdoor Air Pollution Kills More Than 5 Million People Every Year appeared first on Business Press Release Service Distribution | Submit123PR.